Wisconsin Car Accident Broken Bones | Hupy and Abraham, S.C.
You have a limited time to file a car accident case in Wisconsin. 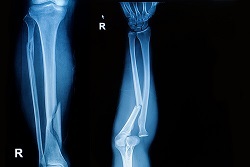 Accordingly, it is important to understand what kind of broken bone injuries can occur in an accident, when you may be able to recover damages for your broken bone injuries, and how to protect your personal recovery. Some of the injuries can take several months—or longer—to heal. You have a diagnosis and you know that you did not have a broken bone prior to your Wisconsin car accident. In order to recover damages for your broken bone injury, however, you are going to have to prove that the accident and your injury were the fault of another driver. The other driver breached the duty of care by failing to act like a reasonable driver would act in similar circumstances. The breach of the duty of care caused your broken bone which would not have occurred but for the actions (or inactions) of the other driver. The evidence that you, the police, your attorney, and any accident investigators find will determine the legal cause of the crash. You may lose time from work or school while you recover. Additionally, depending on the specific break that you suffered, your age, and your overall health you may suffer ongoing complications from your break. Thus, a broken bone is a serious injury that can cause you a lot of physical pain, emotional suffering, and financial hardship. For these reasons it is important to understand your legal rights and to fight for your fair and just recovery. If your bone was broken because of the negligence of another driver then you should not have to pay for your medical expenses, lost income, and the other damages you’ve suffered as a result of that driver’s negligence. However, the insurance company is not going to recommend a fair settlement unless you fight for it. To learn more about your rights after a car accident injury and about what you can do to protect your fair and just recovery, please read a free copy of our book, The Ultimate Guide for Automobile Accident Victims, and please use our online contact form to schedule a free consultation with an experienced attorney today.